There's a splendid scene in one of the episodes of "Only Fools and Horses". Del Boy is sitting in his cluttered flat, listening intently to music through his earphones. Is it Brahms? Is it Liszt? Del Boy himself ends the confusion by throwing down the headphones and declaring with evident satisfaction: "Say what you like, you can't whack the Who!" I endorse Mr Trotter's sentiments. Although more of a Pink Floyd aficionado myself, I have enjoyed the Who from their Mod days, even taking in a concert on their recent tour. One song from their canon came into my mind unbidden today as I contemplated the seven Labour MPs who are quitting the party to form a new grouping in parliament. The song? "Won't get fooled again", renowned especially for Roger Daltrey's throaty scream. In particular, I recalled the line to the effect that the parting on the left is now the parting on the right. Pete Townshend's lyric is generally thought to be a lament for the futility of revolution, or a satire upon the same. Either way, it is about the dysfunctional nature of politics, when principle and hard reality clash. What does today's parting signify? Is it the beginning of a new alignment in UK politics; the ambition of many since the establishment of the SDP in 1981 by the Gang of Four? Perhaps. If so, it is initially a very gentle revolution. The seven - do they yet have a nickname? - are not, at this stage, forming a new party, which would involve recruiting grassroots members, setting up a formal structure, contesting by-elections and the rest. However, that may follow. This movement may build. And, as in the 1980s, the Liberal Democrats (a merger, including the SDP) are watching with interest. To be clear, the seven are seeking support from across the existing political divides. Is it a visceral yell of protest against Jeremy Corbyn's style of leadership? A Daltreyesque scream of pain? Again perhaps. Scottish Labour MP Ian Murray is not one of the seven but he issued a sympathetic statement, arguing that Mr Corbyn must end what he called a "culture of bullying and intolerance where his own MPs feel unwelcome and are being forced out". In response, Mr Corbyn voiced his disappointment and argued that the seven would be better devoting their energies to combating the Tories. That was echoed here in Scotland by Richard Leonard who said it was "time to come together, not divide". Is it driven by Brexit? To a substantial extent, yes. 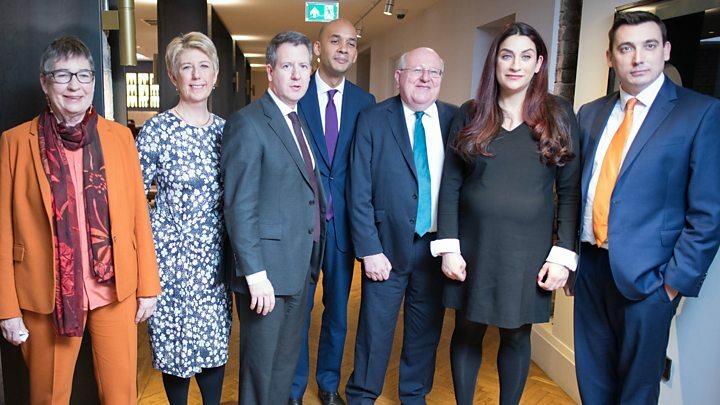 Labour is divided over departing the European Union - with Mr Corbyn, an instinctive Brexiteer, leading a movement which mostly, it would seem, favours EU membership. Both sectors of this divided party continue to seek ways to align with those working class voters, particularly in England, who turned against the EU in the referendum - perhaps unhappy at immigration, perhaps dismayed at their own household income, perhaps resentful of over-weening European influence. The House of Commons, more generally, is currently a febrile place, with new cross-party alliances forming around the issue of Leave versus Remain, supplanting older divisions. It seems, at least, possible that these divisions will prove too caustic for the Conservative Party to entirely heal - although others argue that, if Brexit can ever be reduced in temperature, the Tories could again find common cause, founded upon free market economics and a loathing of Corbyn. But the anxieties and disquiet within Labour predate Brexit and are not wholly predicated upon it. Several of the seven today cite Labour's internal difficulties with anti-Semitism. One said they could no longer acquiesce with what they see as a "hijacking" of Labour by the far left. So today's development is, simultaneously, deeper and shallower than Brexit. Deeper, in that arises from a more fundamental discontent with the party's positioning under Corbyn. Shallower, in that it is, for now, just seven MPs. Far more within Labour are unhappy with the party's stance over departing the European Union. Smile and grin at the change all around. Or maybe not. Your choice.